Although much attention has been focused on fossils representing members of the classic Ediacaran macrobiota, a variety of other organisms are known from the latest Ediacaran Period. These org﻿anisms are likely to have made significant contributions to Ediacaran marine ecosystems, and must be considered when studying large-scale ecology, evolution, and ecosystem structure during this interval. Micro-organisms living on the seafloor appear to have played several important roles in Ediacaran marine ecosystems. Communities of bacteria and other micro-organisms entirely covered the seafloor in continuous 'microbial mats'. There are suggestions that these mats may have helped to stabilize early Ediacaran macro-organisms, and then became a food source for the first mobile organisms in the latest Ediacaran Period (e.g. Ivantsov, 2013). Certain microbes within the mats also played an important role in actually preserving the soft-bodied Ediacaran organisms following burial by sediment, forming sulfide minerals that coated the exterior surfaces of the organisms in a process termed 'death mask' preservation (Gehling, 1999; Liu, 2016; though see Tarhan et al., 2016 for an alternative view on Ediacaran preservation). 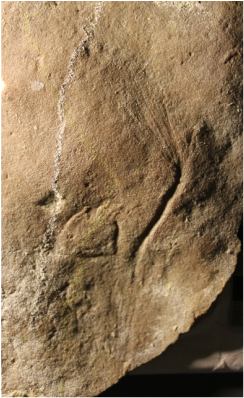 Longifuniculum, a macro-algal fossil from Nilpena, South Australia. SAM P48767. Several localities around the world exhibit fossils that have been interpreted as macro-algae. These can be found alongside members of the Ediacaran macro-biota on individual bedding planes, and although they are most commonly preserved as carbonaceous compressions (e.g. in the Lantian and Miaohe biotas of South China), they can rarely be found as cast and mould impressions, preserved in the same style as the Ediacara-type taxa (e.g. in Australia; Xiao et al. 2013). Algal organisms are considered to have lived in shallow-water settings (since they would have been photosynthetic and therefore needed sunlight), and they exhibit a reasonable range of morphological diversity. Interestingly, the fossil record of macro-algae appears to extend beyond the base of the Ediacaran Period, to an interval >635 Ma (Ye et al., 2015). A wide variety of microfossils are known from the Ediacaran Period. 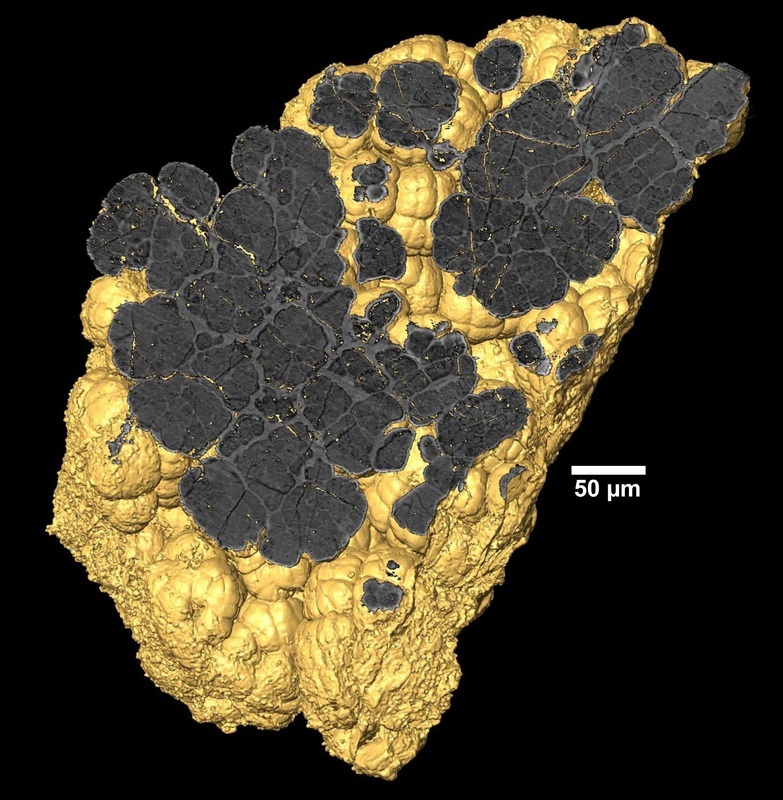 These include rare filamentous and spheroidal fossils of probable bacteria or fungi (e.g. Callow & Brasier, 2009), but two groups are particularly important to study of Ediacaran life. The acritarchs are organic-walled microfossils of uncertain biological affinity, which are common within many Neoproterozoic rocks, and are particularly well-preserved in Ediacaran sections from China, Norway and central Australia. They are likely to include representatives from a variety of different biological groups, and many are interpreted as eukaryotic resting cysts. In addition to recording an additional aspect of Ediacaran life, they are useful for global biostratigraphic correlation. Microfossils from the Doushantuo Formation, South China, imaged using synchrotron tomography. The specimen has been virtually cut to reveal the internal anatomy. These fossils are thought to be red algae. Image courtesy of J. Cunningham. Possible embryo fossils from the Doushantuo Formation of South China are important for the insights they can potentially offer into reproduction, growth, and evolution of early- to mid-Ediacaran organisms. Many of these microfossils and associated tubular forms may be algal, but considerable debate surrounds the question of whether animal embryos are also present within the assemblage (e.g. Yin et al., 2016). Perhaps the strongest line of evidence for the presence of animals in the latest Ediacaran Period comes from trace fossils, which record evidence for the behaviour of organisms. Ediacaran trace fossils are widely recognized in the latest Ediacaran from around 555 Ma onwards (e.g. Jensen et al., 2006), and may extend back as far as 565 million years ago (Liu et al., 2010). They provide evidence for diverse animals moving and grazing on the seafloor, and in rare cases it is even possible to identify the organism that created a trace: organisms such as Dickinsonia and Yorgia have been suggested to be responsible for traces known as Epibaion in Australia and the White Sea (Ivantsov, 2011; Coutts et al., 2016). 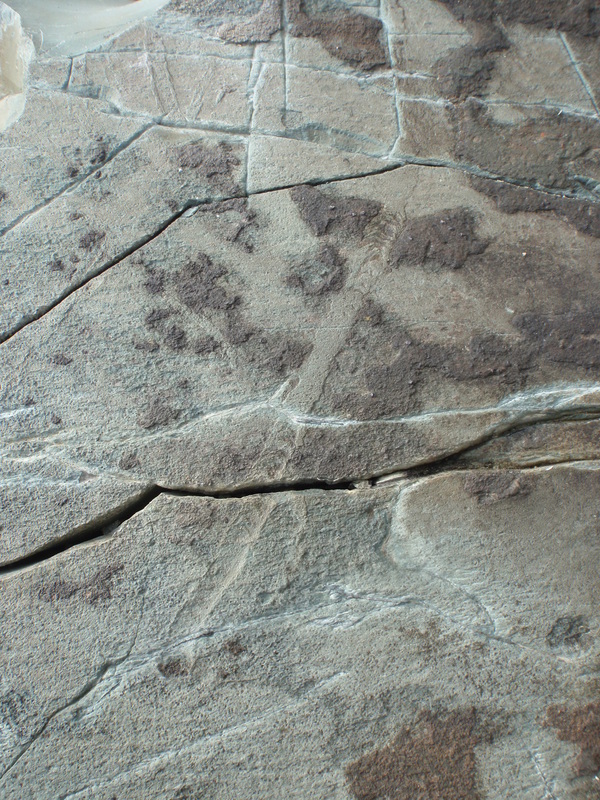 A horizontal surface trace made by an organism moving across the seafloor, Mistaken Point, Newfoundland, 565 Ma. Image courtesy of Alex Liu.